Pizza night is a once a month affair around here and while my boys always stick to some version of your basic pepperoni and sausage, I always try to push the envelope and come up with a new flavor combination that I haven’t seen before. This weekend I went for a butternut squash base and I’ll have a hard time returning to my tomato sauce from here on out. 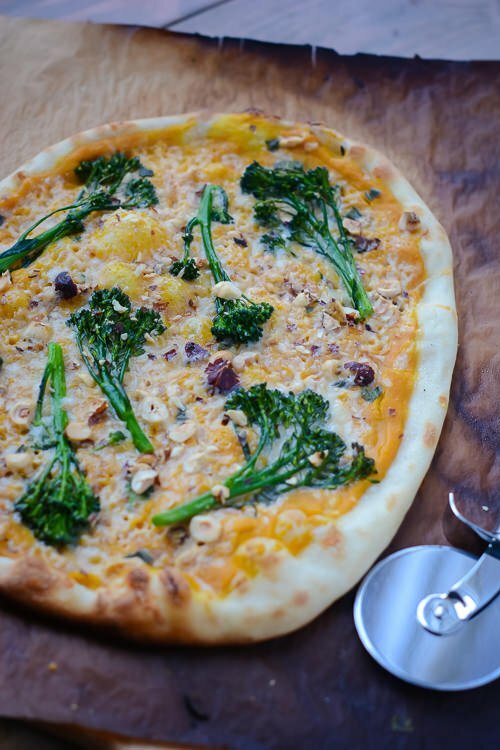 I roasted the squash with some red onion and shallots and then pureed it with a little bit of milk, it makes for the creamiest most decadent tasting pizza base you could ever dream up. 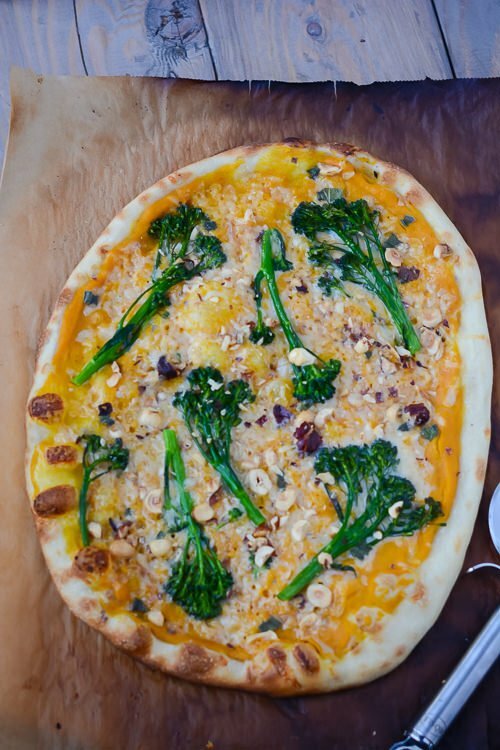 I topped it off with some smoked cheddar, a little broccolini and some chopped hazelnuts. I do encourage you to invest in a pizza stone if you don’t have one and place it directly on the floor of your oven. 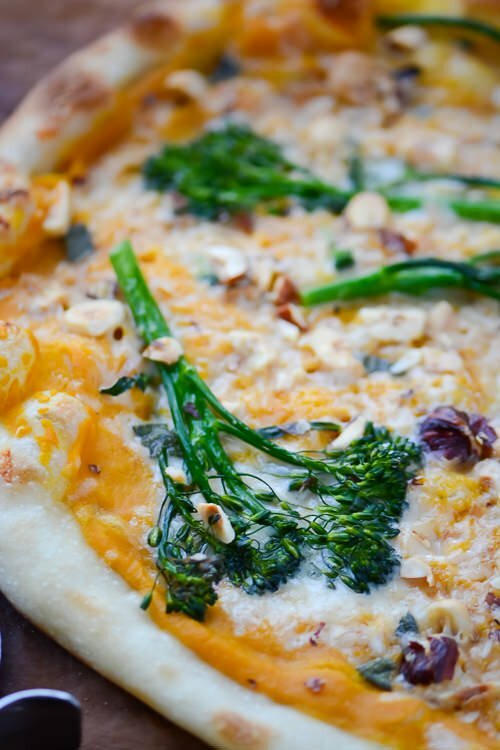 Most conventional ovens have a hard time getting hot enough to get the crust nice and crispy. I liked this so much that I made another pizza today and I think I’ll toss the leftover sauce with a little pasta tomorrow for dinner. What’s your favorite pizza combination? Be sure to check out the bottom of the post for a little music to enjoy with your pizza! Ina another bowl, mix cold water and salt until dissolved; stir in oil. In a heavy-duty standing mixer with a dough hook, place 5¼ cups flour in a large bowl. Stir the yeast mixture again to blend, then add to flour along with cold-water mixture. Beat with the dough hook on low speed until mixture is smooth and not sticky, 10-12 minutes. If dough remains sticky, add 2 more tablespoons flour and beat 2 minutes longer; if still sticky, add another 1 to 2 tablespoons flour and beat until nonsticky and smooth. Scrape dough onto a lightly floured board; cut in half. With floured hands, pick up one portion of dough; pull opposite edges together toward center and pinch to seal. Repeat all around circumference to form a smooth, tight ball. Place each portion in a 1-gallon plastic bag. Squeeze out air and seal bag, allowing enough room for ball to double. Chill at least 10 hours or up to 3 days. hours before you want make the pizza, remove the dough from the fridge and let come to room temperature. (I usually take mine out in the morning and just leave it to rise on the counter until I’m ready to use it. 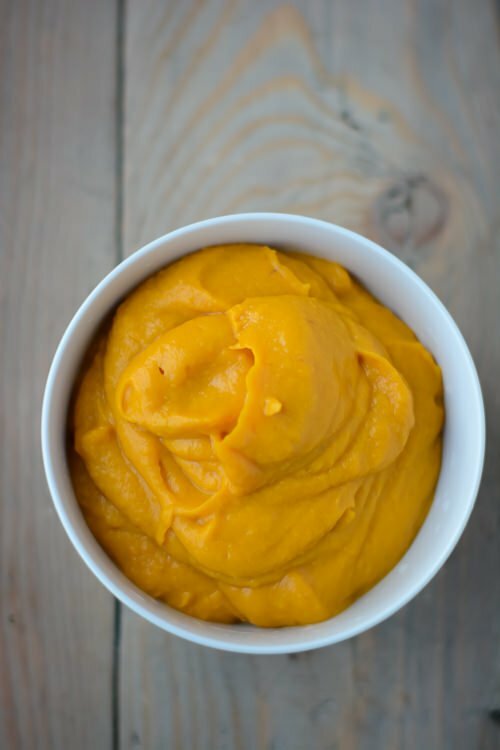 Transfer squash to a food processor or high-speed blender. Add apple cider vinegar, and milk and process until smooth adding a little more milk if needed to thin as necessary. Taste, and season with salt and pepper as needed. 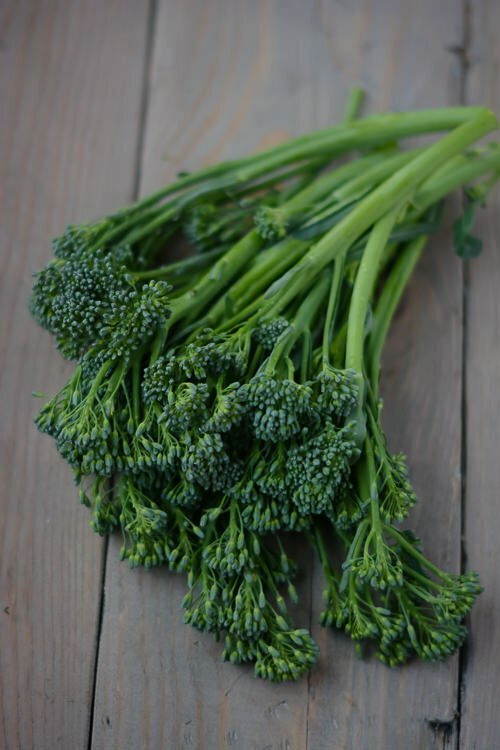 In a small bowl, toss the broccolini with a teaspoon of olive oil and season with salt and pepper. When you’re ready to bake the pizza, heat the oven to 500 degrees. Roll or stretch out the dough to a 12-inch round. If you are having trouble stretching your dough, roll it out, let it rest for 5-10 minutes and then try it again. Allowing it to rest relaxes the glutton in the dough and makes it easier to roll out. I like to roll out my dough on parchment paper so it’s easy to transfer it to the oven. You can also sprinkle a baking sheet or pizza peel with cornmeal to avoid sticking. What better to go with pizza than a cold beer and a little country music? I’ve been really enjoying the new HBO series True Detective and love the opening song by the Handsome Family. It ‘s a haunting song that evokes the darker side of life. This song by Marcus Mumford and Oscar Isaac is from the Coen Brothers film Inside Llewyn Davis is a lovely version of a folk classic. Murder by Death is a new band for me and I love the combination of the cello for their slightly gothic take on country music. Adam Turla’s vocals bring to mind a modern Johnny Cash. I hope you like it Jess if you try it. Let me know what you think, we’ve already made it twice this week! I can’t help myself. I always have a big bag of them sitting in the fridge waiting for me to find another use for them. 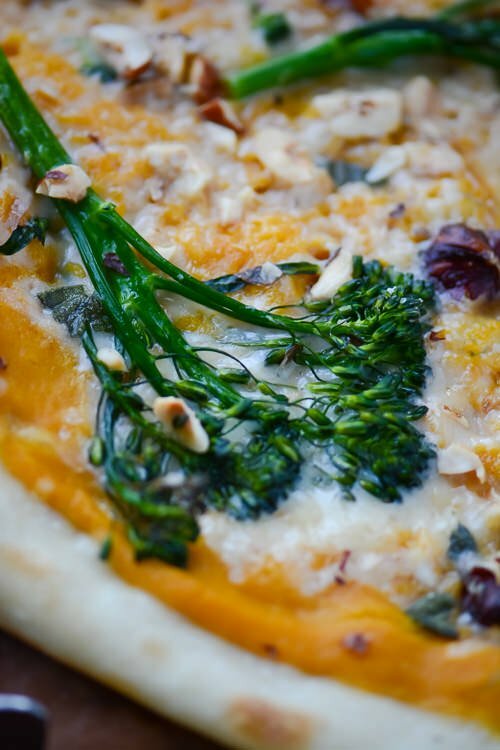 I have just stumbled upon your blog – so many amazing recipes! I love your style of cooking and your photography is beautiful. 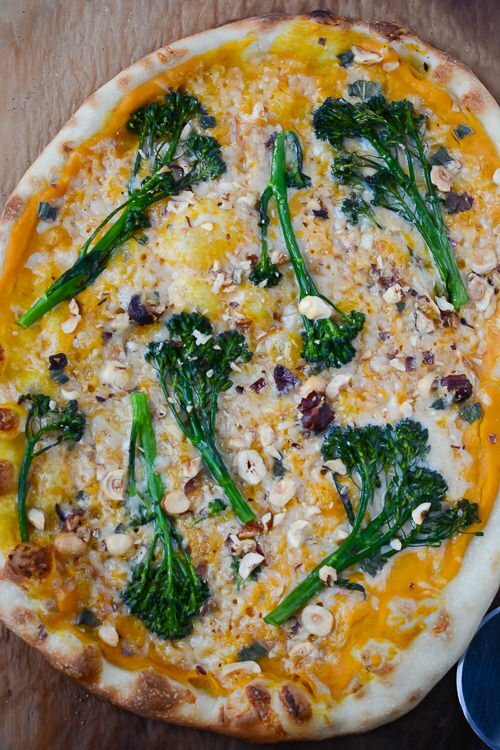 Pinning this pizza recipe, it looks right up my alley, yum! Thanks for checking out the blog and the kind words. I hope you enjoy any of the recipes you try! My photography is still a work in progress but I love working on it! The result? A sweet and savory combination satisfying even my husband’s carnivorous appetite. I loved it and wanted a little more salty/smokiness in it. I wonder if adding just a sprinkle of crispy, diced, smoked bacon would seal the deal. After dinner, my husband complimented me on all the healthy sauces and meals I’ve been making lately. Your recipes have served as answers on how to eat healthier foods while still offering a creative and stimulating palate of flavor and keeping it simple all at the same time. 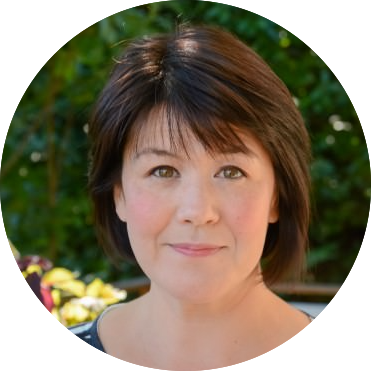 I love following your blog because of your inspiration (of food and more) and our common interests including living in the Greater Portland area. It’s so nice to hear that someone from Portland is reading my blog. I’m glad that you liked the recipe, I swap out sweet potatoes for butternut squash depending on what I’ve got on hand. I have to say that I’ve been using that sauce on everything lately, it’s great just tossed with a little pasta and some fried sage. Thanks again for reading the blog and I’m so glad that I’ve been able to help a little bit in your quest to eat healthier, it’s always a work in progress for us as well!